Participants 16 and older are being sought for the kickoff events for the Bridging 8 Mile initiative this weekend. The events are Saturday at the Boys and Girls Club in Royal Oak and Sunday at Youthville in Detroit, and are designed to bridge Detroit and its surrounding suburbs. A local non-profit, The Association for Youth Empowerment, is launching the initiative to transform the way people relate to one another in the region. Participation is free, but advance registration is required. The Challenge Day program was featured on Oprah and on MTV’s “If You Really Knew Me” series. The Association for Youth Empowerment announces the launch of the Bridging 8 Mile initiative to transform the way people relate to one another in Southeast Michigan. DETROIT/ROYAL OAK – The Association for Youth Empowerment (AYE), a non-profit 501(c)3 organization dedicated to bringing transformational programs to schools and communities in southeast Michigan, announces the launch of the Bridging 8 Mile initiative to transform the way people relate to one another in the region. On July 23 and 24, 2011, groups of everyday people, youth, community leaders, politicians and clergy will participate in two Community Challenge Day events designed to bridge Detroit and its surrounding suburbs, cities and towns. Challenge Day is an award-winning experiential program that has been featured on Oprah, MTV’s “If You Really Knew Me” and Tom Brokaw’s “Bridging the Divide” program. Registration for the Bridging 8 Mile Community Challenge Day events is open to youth and adults 16 and older. Southeast Michigan community leaders are encouraged to attend. Suggested tuition is $50 per person based on ability to pay, however several scholarships are available. Saturday, July 23, 2011, 8:30 a.m. – 4 p.m.
Sunday, July 24, 2011, 8:30 a.m. – 4 p.m.
Bridging 8 Mile is an initiative developed by the Association for Youth Empowerment that is dedicated to transforming Detroit, its suburbs, its people and the way we relate to one another. Bridging 8 Mile was founded on the belief that when people unite for the greater good, positive change is inevitable. Our ultimate goal is to connect COMMUNITIES, inspire COMPASSION and take ACTION. For more information call the Bridging 8 Mile Hotline at 313-226-1626 or visit www.bridging8mile.org. Registration for the Bridging 8 Mile Community Challenge Day events is open to youth and adults 16 and older. Southeast Michigan community leaders are encouraged to attend. Sunday, July 24 2011, 8:30 a.m. – 4 p.m.
Bridging 8 Mile is an initiative developed by the Association for Youth Empowerment that is dedicated to transforming Detroit, its suburbs, its people and the way we relate to one another. Bridging 8 Mile was founded on the belief that when people unite for the greater good, positive change is inevitable. Our ultimate goal is to connect COMMUNITIES, inspire COMPASSION and take ACTION. For more information call the Bridging 8 Mile hotline at 313-226-1626 or visitwww.bridging8mile.org. Founded in 2006, AYE is dedicated to challenging and empowering young people to create positive change. The organization partners with community members and organizations who share a common goal of eliminating social oppression and of fostering respect, acceptance and compassion in our schools and communities. Visit www.associationforyouth.org. Traveling the world, I can expect to have eye opening cross–cultural experiences. But to have such an experience in my own backyard – in downtown Detroit – that’s a different story. 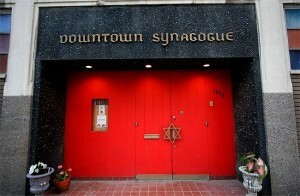 On December 17, 2011, my 14 year old son, Kwesi, and I attended service at the Downtown Synagogue, along with three or four other African Americans. Every once in a while we could hear a word or two: Kiddush, adonai, and some names. We didn’t know the meaning. We just followed the directives, “now we are going to page 97.” We did that for over an hour. I recognize Hebrew when I see it. I just can’t read a single letter. When the Big Scroll was taken from behind some curtains and, later, walked through the congregation, Kwesi encouraged me to kiss it and touch it like the congregants who wore yarmulkes and prayer shawls. I touched it, after kissing my hand first. I probably would have kissed the Big Scroll, if I didn’t have a couple of people to reach over. Before the service ended, the smell of food, good food, wafted into the sanctuary. I wanted Marti to get through his explanations to us special guests, so that I could join the food. I got to the food. To my surprise no candles were lit. Everyone had braided bread and wine or juice. I should have had juice or braided bread before the wine. I managed. I don’t know what we were talking about. One of the African–American ladies in my group asked if I was Jewish, because I was wearing the black silken skull cap. I responded, “No. But I didn’t know there were so many black Jews in Detroit.” There were two or three black men and women there who were fully engaged in the Hebrew Service and the meal prayer. She responded, “Neither did I.” We went back to our delicious meatless dishes. As I exited the Red Door, a small half cylinder, tacked to the door frame, caught my eye. I thought, “I’ve seen these painted over in doorways around Detroit.” Our group, along with Rabbi Dorit, who invited us to the synagogue, proceeded to our cars and headed to the Detroit Institute of Arts. We viewed the exhibit Rembrandt: The Faces of Jesus. My overall experience was one of being in the inner circle, witnessing a great mystery. As an African American, I’ve started to say that if I were a Jew I would be insulted to hear: a dollar changes hands in the Jewish community two to three times before it leaves; the Jews were oppressed: why can’t you Blacks and Indians get it together; and, they worked me like a Hebrew slave. I’d be insulted for people to act as if they knew me and didn’t understand my highest values. I didn’t hear any preaching; didn’t see any waiting for G-d’s salvation; and, didn’t see any passing of money. The congregants’ relation to the Big Scroll, and the collective reading of it, was at the heart of the community I participated with behind the Red Door. None of the cultural cliques address what I took away with my experience of crossing a cultural line and my participating the best I could in the service and the meal. Literacy, a common focus and fellowship, are the best foods ever. Robert Cooper is a world traveler and cultural experience enthusiast who initiated a Japanese language program in Detroit Public Schools after living abroad and participating in a study abroad program with Huston Smith. He is the president of the Association for Youth Empowerment and serves on the Leadership Team for the Bridging 8 Mile initiative. He is also a coach and leader at Landmark Education. inescapably tethered to it by their blue tooth headsets. They zoom by curbside cemetaries without blinking. Teenagers walk home from school. Laughing and talking without a care in the world. Like a memory that they’ve always known and felt, but have somehow forgotten. So the hope they hide is the flame that keeps them warm in this blizzard even when they forget it’s there. Some of the people holding cardboard signs may be on some of your favorite Motown songs. There are spots of coney islands and liquor stores, like spots on a dalmation. Dream cruisers sit in lawn chairs watching vitinage camaro’s fly by like they’re equipped with wings. rushing because of being trapped in their reality of life being drastic. They take a deep breath and remember Black Bottom. Inside Baker’s Lounge fingertips dance over ebony and ivory keys while a voice is crying out. that used to separate whites from blacks. My own eyes have washed over it. On a Saturday afternoon, men, women, and children gather in representation of a movement that breaks the stereotypes of fear, apathy, violence, and neglect. shaking hands and dancing and reuniting. Because shifting the collective mindset of an entire region is a monumental task worthy of the people next to you right now. Steve Johnson is an educator and entrepreneur born and raised in Detroit. 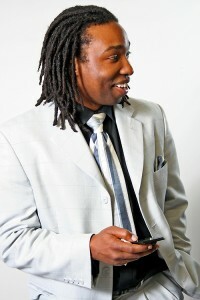 He has been a published poet since his late teens and has experience in video/film production. During his college years at Wayne State University, he coupled his passion for the arts with his devotion for helping people and began a journey in entrepreneurship. He currently has a company that promotes Urban Ballroom dancing on an international scale and is building others. HAMTRAMCK (February 5, 2007) – A diverse group of more than 90 Hamtramck-area students, parents and volunteers participated in the city’s first Community Challenge Day event. The day-long workshop was held Saturday, Jan. 27 at the Hamtramck Community Center. Mostly 7th through 9th graders participated in the event, sponsored by the Hamtramck Recreation Commission, Thomas Mall of Trendwell Energy Corp., the Association for Youth Empowerment, ACC and Acts 29 Fellowship. Challenge Day is a nonprofit organization that offers life-altering, experiential workshops that provide participants with tools to work collaboratively to develop and sustain proactive solutions that prevent social oppression and its symptoms such as suicide, teasing/bullying, violence and drug abuse. Through a series of games, activities, group discussions, icebreakers and trust-building exercises, participants learn how to break down the walls of separation and create new levels of respect and communication within themselves to share with their peers and families. Each student who pre-registered for the event was entered into a drawing. Six grand-prize winners were selected for items donated by local merchants, including Amicci’s Pizza, Main Street, Little Caesars, Video 22, Polish Village and Kumon Math and Reading Centers. In addition, Arlington Heights, Ill.-based Rhino Wear Apparel provided t-shirts for all attendees. To learn more about the program visit www.challengeday.org or call the Association for Youth Empowerment at 313-427-9529 for information about scheduling an event locally.